In Limpopo Province of South Africa, a trial was conducted over four seasons (one each year, from September 2011 to May 2015) to assess the productivity of Moringa oleifera 'PKM 1' grown with tropical legumes. Season 1 was devoted to the establishment of 120-m long rows of moringa trees, with seeds spaced 1 (in-row) × 3 (between-row) m. Except for a 1-m wide weed-free band at the base of each moringa row, the alleys were kept in native grasses to minimize weeding. Arranged in a randomized complete block design with five replications, treatments consisted of a no-legume control and four legumes [cowpea (Vigna unguiculata 'ITD98'), jack bean (Canivalia ensiformis), lablab (Lablab purpureus 'Highworth') and pigeon pea (Cajanus cajan 'Kranti')] sown below the moringa trees during seasons 2 and 4. During season 3, the 1-m wide weed-free strip beneath the moringa trees was sown to okra (Abelmoschus esculentus) and kale (Brassica oleracea). The moringa trees were heavily mulched with straw over the winter dry seasons, and pruned to a height of 1 m at each of two leaf harvests per season (2-4). Total season-2 (223-279 kg ha-1) and season-3 (314-466 kg ha-1) moringa powder yields were unaffected by season-2 legumes. Season-4 moringa productivity, however, was lower (P<0.0001) with (191-340 kg ha-1) than without (473 kg ha-1) legumes, likely due to weather conditions favoring legume competition with moringa. Legumes performed better under moringa than the vegetables. Results indicated that, where short-duration freezes occur, 1 ha of this system can provide - over the course of a year - a daily supply of 5 g of moringa powder for each of 120-153 people by the second season. 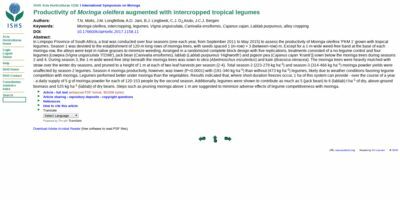 Additionally, legumes were shown to contribute as much as 5 (jack bean) to 6 (lablab) t ha-1 of dry, above-ground biomass and 525 kg ha-1 (lablab) of dry beans. Steps such as pruning moringa above 1 m are suggested to minimize adverse effects of legume competitiveness with moringa.